The previous blog note discussed the three elements required to see color; a white light source, an object, and a human observer. In order for HunterLab instruments to measure color we need to be able to quantify, or assign numbers, to these three elements. A light source emits radiant energy in the form of visible light. Some examples of light sources include the sun, a table lamp, and overhead fluorescent light. Visible light is a small portion of the electromagnetic spectrum that includes X-rays, ultraviolet and infrared light, and radio waves. The visible spectrum ranges from approximately 400 nm to 700 nm. The type of light that an object is viewed under can affect its appearance. 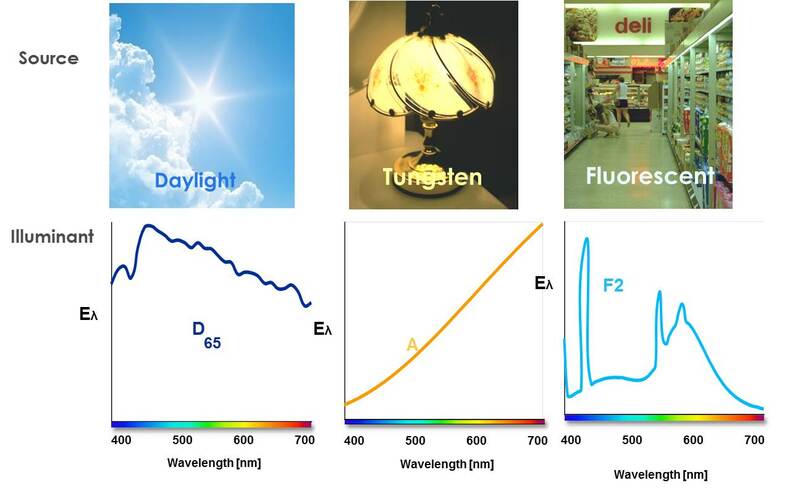 In order to quantify these white light sources, the CIE (Commission International de l’Eclairage, the governing body of color) has developed standardized illuminants for color measurement. An illuminant is a quantifiable table of numbers that represents the relative energy versus wavelength for a light source. By representing the white light source as an illuminant (a table of numbers) we are able to quantify the first element of the visual observing situation. This enables HunterLab instruments to measure color as the human eye sees it.